Tulsa’s Gathering Place is adding “Best New Attraction” to its list of accolades after winning the USA Today’s 10 Best Readers’ Choice 2018 Best New Attraction award. This morning, Executive Park Director Tony Moore was joined by Tulsa Mayor G.T. Bynum in the Williams Lodge to announce the Park receiving the national honor at the same time USA Today announced it to their 2.6 million readers. 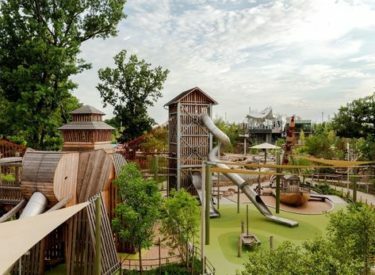 The Gathering Place faced off against 19 other national contenders from metropolitan cities across the country, including a comedy club, historical museums, heritage centers, theme parks and other unique attractions to ultimately claim the title of Best New Attraction. A project of George Kaiser Family Foundation, Gathering Place, with a first phase of 66.5 acres, will ultimately transform nearly 100 acres of Tulsa’s waterfront along the Arkansas River into a dynamic and active space when the project is completed. A public-private partnership, the Foundation and numerous corporate and community philanthropists gave ownership of the $465 million park to River Parks Authority, who in turn signed a long-term operational and management lease back to an entity of the foundation to ensure the highest quality operation, maintenance and programming for the life of the park. Oklahoma Lt. Governor Matt Pinnell, who was also appointed Secretary of Tourism and Branding this week by Gov. Kevin Stitt, congratulated the George Kaiser Family Foundation and the City of Tulsa on the announcement. Gathering Place was chosen to be one of 20 nominees for the USA Today 10 Best Readers’ Choice Awards by a panel of relevant experts, which includes editors from USA Today 10 Best.com and sources for both of these media and other Gannett properties, according to 10 Best.com. Voting was open to the public for four weeks, allowing users to vote for one nominee per category daily.